Pico, Climax, and WEARVR make Climax Studios mobile VR titles available in one place for the first time. 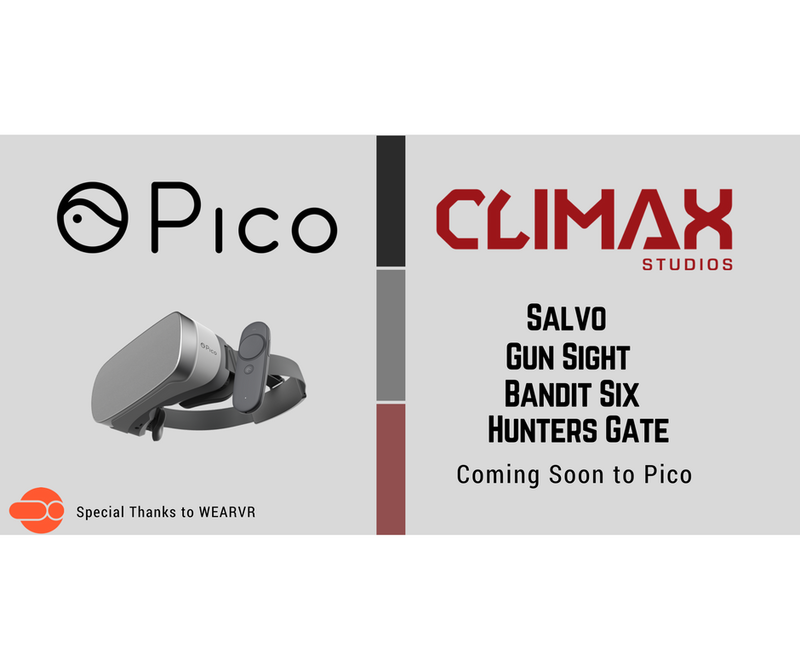 SAN FRANCISCO, Dec. 7, 2017 /PRNewswire/ — Pico Interactive, maker of high-end ultra-portable virtual reality (VR) headsets , has teamed up with Climax Studios, a veteran game development studio based out of Portsmouth, Hampshire, and WEARVR, the leading independent Virtual Reality App store, to deliver four new VR experiences on Pico’s Goblin platform. The titles include: Bandit Six, Salvo, Gun Sight and Hunters Gate. “We are very excited to be bringing our mobile VR catalogue to Pico’s Goblin all-in-one headset. With Bandit Six, Salvo, Gun Sight and Hunters Gate you have a great mix of titles and it’s the first platform that you can play all four in one place!” said Climax Studios CEO Simon Gardner. With this announcement, Climax and Pico add affordable, top-tier VR games for users to easily play on-the-go. “We are thrilled to add more awesome content to the 60+ titles on the Pico platform and allow people to experience Pico’s insanely easy-to-use headsets,” said Pico Interactive VP of Business Development Paul Viglienzone. WEARVR will manage the porting process and facilitate the publishing partnership. “WEARVR is delighted to be working with Climax Studios, in partnership with Pico, to bring their incredible VR games to the all-in-one headset,” said WearVR CEO Nic Mitham. The games will be available soon on Pico Goblin and Neo headset thereafter. Pico Interactive focuses on creating amazing VR entertainment platforms for consumers and businesses alike. Our mission is built around the principle of “user first design” and we design all our products with this principle in mind. Our hardware products are designed to be instantly accessible and ultra-portable (no phones or wires needed). Our software platform is designed to deliver VR gaming and entertainment directly to users wherever they may be. For more: https://www.pico-interactive.com. Climax was founded nearly 30 years ago and is located in the coastal city of Portsmouth. We have an extensive history in developing all kinds of digital experiences across all formats, delivering entire games through to co-development and technological problem solving and we’ve won many awards along the way. We’re continuing to be involved in new technologies and build our lead in AR and VR and have several projects currently in development, as well as console projects. For more: https://www.climaxstudios.com. Founded in early 2014 as an incubator project between Dubit and KZero and seed funded in February 2015, WEARVR is the leading independent Virtual Reality App store. We host and promote over 2,000 VR games and experiences, across a wide range of genres. From rollercoasters, driving and flying sims through to 360-degree videos, social apps and jump scares, you’ll find them all on WEARVR. For more: https://www.wearvr.com.